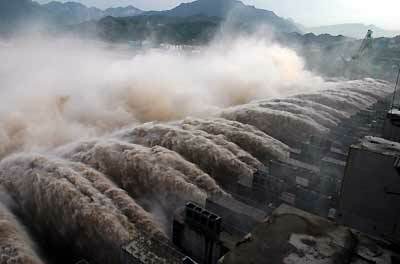 China has dispatched heavily armed troops to the Three Gorges Dam, the world's largest hydropower project, to guard against any terrorist attack, a newspaper said on Tuesday. The forces had begun patrolling waters near the US$25 billion project in central Hubei province, built also to tame the flood-prone Yangtze River, the online edition of Huaxia Times, said. Soldiers manning the dam had been equipped with armed helicopters, airships, armoured vehicles and robots to defuse bombs, the newspaper said. "The move symbolises the completion of the deployment of armed, anti-terror troops at big bridges, dams and hydropower plants along large rivers," the paper said. China has trained its anti-terror forces with "powerful style, flexible command and specific strengths", it said. In June, the China Youth Daily quoted PLA Lieutenant-General Liu Yuan as saying China would be "seriously on guard against threats from Taiwan independence terrorists". His comments came in response to the US Pentagon's annual report to Congress on China's military power, which said unnamed proponents of strikes against China "apparently hope" that merely establishing places like the Three Gorges Dam as targets would deter Chinese military action. Construction of the dam finally began in 1993 and engineers blocked the Yangtze at the Three Gorges Dam in June last year. China has staged a string of anti-terror manoeuvres throughtout the country, to be better prepared for the rise in global terrorism since the September 11, 2001 attacks on the United States.